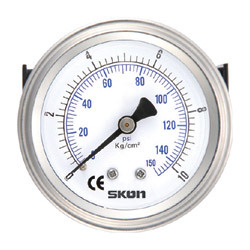 This industrial pressure gauge is designed for fluid medium which does not clog connection or corrode brass alloy. Also for gas compatible with cupreous metals of the sensing element and connection. Field include: Penumatics, hydraulics, compressors, mechanical and energy system engineering, heating, ventilation, air conditioning, cryogenics, food industry, pharmaceutical and biotechnical industry. 1. Normal size: 23mm, 40mm, 50mm, 63mm. 3. Ranges: -1/0 to -1/20 kg/cm-30in hg~500psi, 76cm hg~35kg/cm² (bar) , 0/1 to 0/250 kg/cm-30in hg~500psi, 76cm hg~35kg/cm² (bar). 4. Operating temperature: working temperature 60℃ max., Ambient: -25℃ ～60℃. 5. Connections: brass alloy, ower back mounting / center back mounting 23mm thread:12mm 40mm thread:11mm 50mm, 63mm thread:14mm 1/4’’, 1/8’’, pt, npt, pf, bsp. 6. Sensing element: bourdon tube, brass alloy, ＜70kg/cm² (bar) coil , ≧70kg/cm² (bar) helicoil. 8. Dial: aluminium in white, lettering in black. 10. Case: black-painted steel with black-painted steel. 11. Upper ring: bayonet or bezel ring, black-painted steel. 12. Window: normal glass or acryli. (1) Stainless steel black-painted front or rear flang. (2) Extemal adjustable red mark pointer (max. Or set pointer).